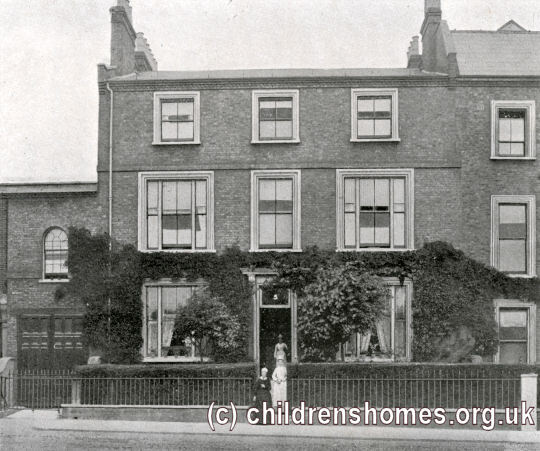 In 1860, the London Female Preventive and Reformatory Institution (LFPRI) opened a home for a home for penitent 'fallen' young women at 5 Parson's Green, Fulham, London SW6. Use of the property had been offered to the Institution by Dr Holt Yates after he had attended a meeting of the Midnight Meeting Movement, a missionary organisation formed in 1860 to take the Christian Gospel to 'women of the street' in London and other cities. The Movement's Committee included the Secretary of LFPRI, Edward Thomas. After the death of Dr Holt Yates in 1874, the Institution gained ownership of the property and in 1876-77 replaced the existing small houses on the site with a new building named the Holt Yates Memorial Home. Mrs Holt Yates laid its foundation stone on August 19th, 1876, and the Home was opened on April 14th, 1877. At the opening ceremony, it was noted that of the 8,505 fallen women admitted to the Institution since its foundation, 7,000 were domestic servants. There had been 1,880 re-admissions to the homes and only 315 dismissals. Just 34 marriages had been recorded. On 28th December, 1877, the Home became a Certified Reformatory allowing it to receive 'fallen and degraded' girls placed by the courts as an alternative to prison. The premises could accommodate up to 30 girls, aged 15 years or over. As well as court committals, the Home also continued to take voluntary admissions. The opening of such an establishment was welcomed by its official inspector as it would be able to take cases which would be undesirable to place alongside comparatively innocent girls in ordinary Reformatory Schools. However, ten years after its opening, it was noted that the Home had received only two such cases. The Home was described as having a large garden, and a good laundry and washhouse. Most of the girls were employed in laundry needlework, with a certain number attending to the household work and kitchen. 'Good moral and religious' influences were brought to bear on the inmates, and the home was managed with 'special experience and great tact'. Home was superintended for many years by Mrs Emily Hills. She was succeeded in around 1891 by Miss Hills. The Home resigned its Reformatory certification on December 13, 1893, and continued in its role as a 'rescue' home until the late 1930s. The premises no longer exist.